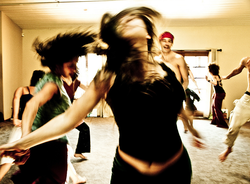 Dancing Freedom Friday is a free-form ecstatic dance practice that invites you to get out of your head and into your body. It helps you release mind chatter and tension, and find freedom and joy through movement. Open to all levels of fitness. You don't have to be a 'dancer' - if your heart beats, you can dance! Enjoy connecting with your body and breath in a safe environment. Together we dance an elemental wave, connecting with the Earth elements of earth, water, fire, air, ether - to release, explore, deeply listen to, and come home to our authentic self. For more info, click here.